I have a question. I am working on Babylon js using Unity. I would like to use Alpha material in Unity, but what material should I use to apply Alpha in Babylon? I've tried a lot, but it does not work. Please answer. And thanks to all those who have looked at this question. But for a quick answer: Set the "Rendering Mode to Transparent"
I'm having a problem regarding the export of a material. 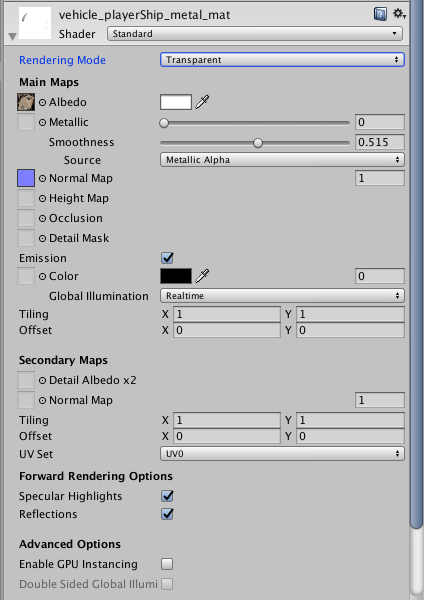 I have no Albedo-Texture with Alpha but I want to use the Alpha of the Albedo-Color. Currently when i export it the mesh doesn't have any Alpha applied.